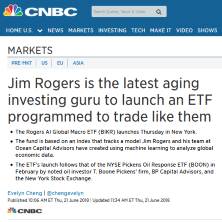 Jim Rogers is the latest investing guru to venture away from active management by attaching his name to an exchange-traded fund. The Rogers AI Global Macro ETF (BIKR) launches Thursday in New York. It’s based on an index that tracks a model Rogers, 75, and his team at Ocean Capital Advisors have created using machine learning to analyze global economic data. The ETF, which primarily follows U.S.-listed single-country ETFs, will rebalance monthly based on that analysis. “We think it will hit a particular segment of the market that has followed Jim and is interested in following him in an ETF,” said Sam Masucci, founder and CEO of ETF Managers Group, Ocean’s partner in launching the fund.